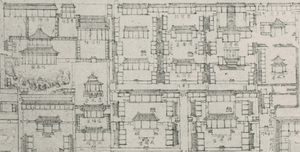 250 years of change in Beijing revived with maps and photographs. Digitize "Complete Map of Peking, Qianlong Period," an old map of Beijing created about 250 years ago, and overlay it on the current map. 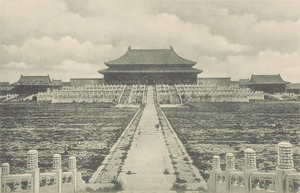 Reconstruct the old landscape of Beijing by placing old photographs, taken about 100 years ago, at the original location and direction. Analyze the old map of 250 years ago and the old photographs of 100 years ago together to get the whole picture of Beijing. Copyright (C) 2008-2013, Digital Silk Road Project, National Institute of Informatics.